Teppanyaki is categorized under Japanese cuisine, the word teppanyaki is derived from two different word i.e “Teppan” which means iron plate and “Yaki” meaning grilled, broiled, or pan seared. Teppanyaki is basically a live kitchen cooking which is done in front of the guest, the diner determines the style in which the food should be cooked, the diner himself selects the seasoning from the available variety of seasonings, rest is the work of the teppanyaki chef who uses his skills and equipment’s to ready the dish. Mostly one dish at a time is done so that the diner can experience and admire the finesse of the cooking. Teppanyaki should not be confused with barbecue grill, which has charcoal or gas flame and is made with an open grate design, whereas teppanyaki plate is a flat iron plate which is more suitable for small ingredients like rice, egg, chopped vegetables, and small meat cuts. The originator of the teppanyaki style steakhouse is the Japanese restaurant chain Misono, which introduced the concept of cooking Western-influenced food on a teppan in Japan in 1945. The teppanyaki style has existed in Japanese cuisine for centuries, where it was used as small grill by families in Japan. 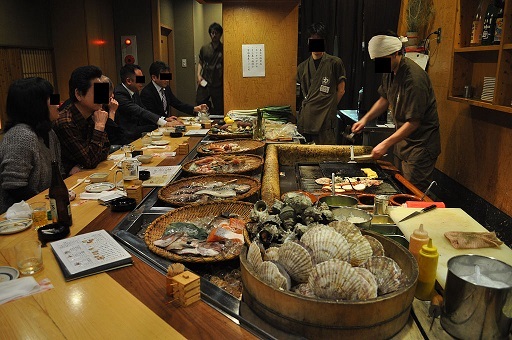 Globally teppanyaki style is considered as Japanese style of cooking but most of the people in Japan strongly considered it of western origin, in fact some of them might take it in offence if teppanyaki is considered Japanese. Teppanyaki basically has influence of western cuisine in it hence it is also visible in the ingredients, the common ingredients used are beef, chicken, shrimp, lobster, scallop, assorted vegetables. Soyabean oil is commonly used to cook the ingredients in teppanyaki dishes. Common accompaniments for teppanyaki dish includes mung beans, zucchini (even though it is not popular and rarely found in Japan), garlic chips and fried rice, restaurant all over the world also offer various sauces but in Japan typically only soy sauce is served with teppanyaki dish. Literally means “Fried Buckwheat”. Sold traditionally in festivals, yakisoba is said to have been derived from the Chinese ‘Chow Mein’ but like the ramen it has been integrated into the Japanese cuisine. Despite the fact that the term ‘soba’ is incorporated in the dish’s name which means made form buckwheat flour, yakisoba is NOT made from buckwheat noodles but from wheat flour. Typically Yakisoba is flavored with condiments similar to oyster sauce. It is prepared by frying ramen-style noodles with bite-sized pork, vegetables (usually cabbage, onions or carrots) and flavored with yakisoba sauce, salt and pepper. It is served with a multitude of garnishes, such as aonori (seaweed powder), beni shoga (shredded pickled ginger), katsuobushi (fish flakes), and mayonnaise. Yakisoba is most familiarly served on a plate either as a main dish or a side dish. 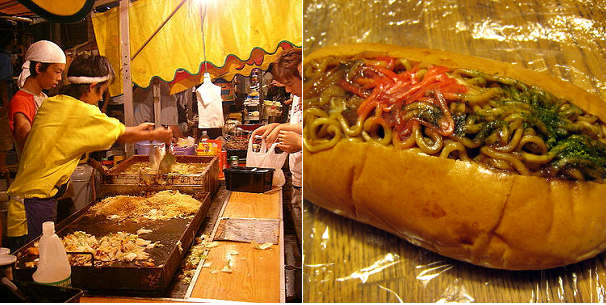 Another popular way to prepare and serve yakisoba in Japan is to pile the noodles into a bun sliced down the middle in the style of a hot dog, and garnish the top with mayonnaise and shreds of pickled ginger. The name okonomiyaki is again derived from two words “Okonomi” meaning “what you like” and “Yaki” means “Grilled or Seared”. Okonomiyaki is a batter fried cake that is grilled over an iron plate and is somewhat similar to pizza (Japanese Pizza) and omelette. Okonomiyaki is mainly associated with the Kansai or Hiroshima areas of Japan, but is widely available throughout the country. Toppings and batters tend to vary according to region. The batter for okonomiyaki consists of flour, grated yam, water or dashi, eggs and shredded cabbage and ingredients such as green onion, meat, thin pork belly meat, octopus, squid, shrimp, vegetables, mocha, cheese, konjac, etc. The batter and other ingredients are pan-fried on both. Cooked okonomiyaki is topped with ingredients that include otafuku/okonomiyaki sauce (similar to Worcestershire sauce but thicker and sweeter), aonori (seaweed flakes), katsuobushi (bonito flakes), Japanese mayonnaise, and pickled ginger (beni shoga). Okonomiyaki is cooked on the teppan using metal spatulas that are later used to slice the pancake. 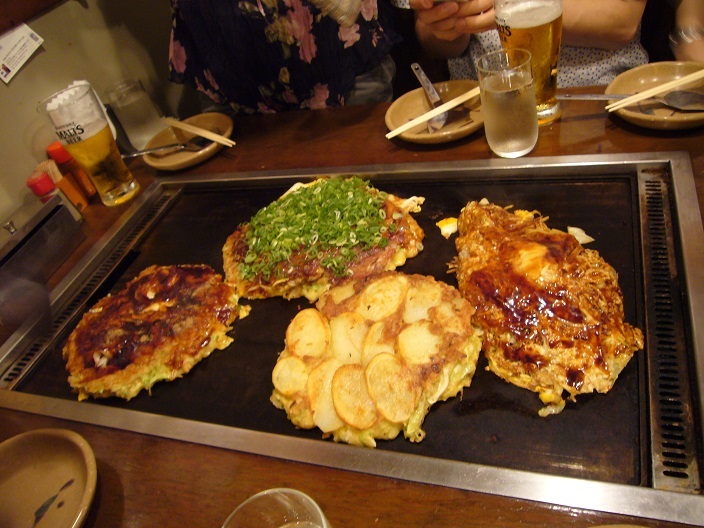 Thera are variation of okonomiyaki such as Kansai area, Hiroshima area and other area. Monjayaki (also called as “monja”) is a type of Japanese pan-fried batter with various ingredients. It is somewhat similar to okonomiyaki. Monjayaki, a specialty of the Kantō region, is made with a dough using more liquid than in okonomiyaki. The ingredients are finely chopped and mixed into the batter before frying. The mixture is far runnier than okonomiyaki, and it has a consistency comparable to a pool of melted cheese when cooked. It is then eaten directly off the iron grill using a small spatula. Robatayaki (“fireside-cooking”), often shortened to just robata, refers to a method of cooking, similar to barbecue, in which items of food on skewers are slow-grilled over hot charcoal. Traditionally, the food consists of a combination of morsels of seafood and vegetables, but other kinds of food that are suitable for grilling may also be offered. Jingisukan (“Genghis Khan”) is a Japanese grilled mutton dish prepared on a convex metal skillet or other grill. The dish is particularly popular on the northern island of Hokkaidō, in China and in Thailand. The dish is rumored to be so named because in prewar Japan, lamb was widely thought to be the meat of choice among Mongolian soldiers, and the dome-shaped skillet is meant to represent the soldiers’ helmets that they purportedly used to cook their food. Yakiniku, meaning “grilled meat”, is a Japanese term which, in its broadest sense, refers to grilled meat dishes, it is commonly referred to a Japanese style of cooking bite-sized meat (usually beef and offal) and vegetables on gridirons or griddles over flame of wood charcoals carbonized by dry distillation (sumibi) or gas/electric grill. 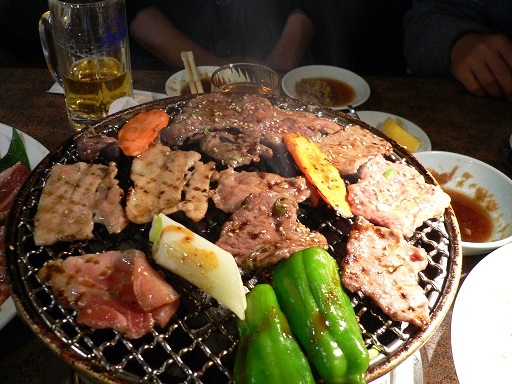 The word Bulgogi literally means fire meat in Korean, and is derived from the Pyongan dialect. It refers to marinated meat, (generally beef if used without a qualifier), cooked using traditional grilling techniques such as gridirons or perforated dome griddles that sit on braziers, unlike deep frying or boiling in water. 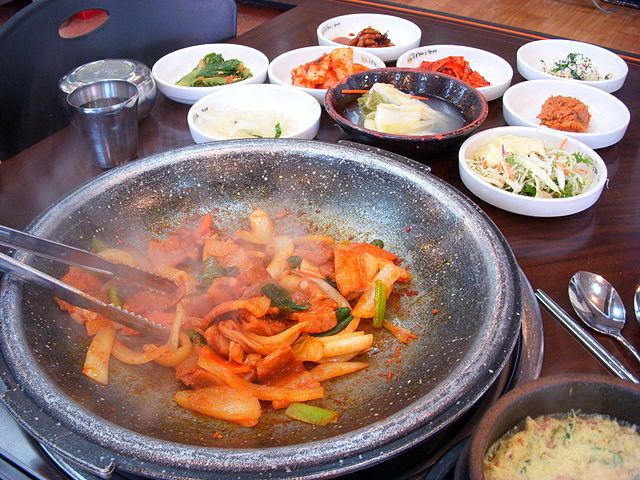 The term is also applied to variations such a dak bulgogi (made with chicken) or dwaeji bulgogi (made with pork), depending on what kind of meat and corresponding seasoning are used. Teriyaki is a cooking technique used in Japanese cuisine in which foods are broiled or grilled with a glaze of soy sauce, mirin, and sugar. The word teriyaki derives from the noun “teri”, which refers to a shine or luster given by the sugar content in the “tare”, and “yaki”, which refers to the cooking method of grilling or broiling. Traditionally the meat is dipped in or brushed with sauce several times during cooking. The tare is traditionally made by mixing and heating soy sauce and sake, or mirin; and sugar or honey. The sauce is boiled and reduced to the desired thickness, then used to marinate meat which is then grilled or broiled. Sometimes ginger is added and the final dish may be garnished with spring onions. Fish such as yellowtail, marlin, skipjack tuna, salmon, trout, and mackerel is mainly used in Japan, while making a teriyaki but is western cooking chicken, pork, lamb, and beef, duck is more often used. Other ingredients sometimes used in Japan include squid, hamburger steak, and meatballs.